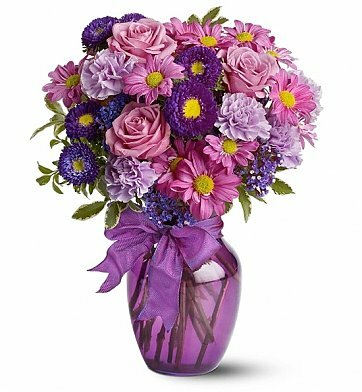 A stylish vase holds a garden of purple blossoms such as roses, asters, carnations, and chrysanthemums. The bouquet is artfully accented with lush contrasting greenery and a matching satin bow. Purple Statice, Lush Greenery and Satin Ribbon. Standard Arrangement Measures 10" x 16". Lavender Garden Bouquet is a hand delivered gift. These gifts are delivered by one of our local design centers located throughout the United States and Canada. Same day delivery is available for most gifts when ordered before the cutoff time. The cutoff time for Lavender Garden Bouquet is 12 PM in the recipient's time zone. It has been almost 3 weeks since I received this beautiful bouquet and they STILL look great!!! I have never once bought flowers that lasted much more than a week, and many delivered were in the same price range. On top of it, they hand-wrote the note I added, which I have never seen before either. HIGHLY recommend this service! The flowers arrived when I was told they would. They were fresh and looked great. My granddaughter loved her flowers and when I have to send flowers in the You're my go to shop. The flowers were beautiful, wonderful, spectacular. Such joy to the recipient. We were both very pleased. The arrangement was fantastic. The was one problem. My name as the sender was not put on it. The receiver sort of figured out who sent it and called me. Very impressed. Photo received showed a beautiful bouquet of fresh flowers as pictured on the website. The flowers were hand delivered on day promised. . . actually in mid-morning, which was great! My niece was thrilled with the beauty of the bouquet. M Aunt that love's purple extremely loved receiving this gift from me to help celebrate her 85th Birthday in N.J. as I live in Vermont. She stated, "The flowers and arrangement are beautiful"!. The same day I had called the flowers were delivered within a 4 hour window. I was so impressed that the flowers were delivered just a few hours after I ordered them! I sent this because I could not be there in person and my friend loves lavender roses. I have been thanked at least four times and told how beautiful the arrangement was. I could not believe how big a hit they were. I will definitely consider other offerings from this vendor in future. Delivery was made quickly and the recipient was impressed by the delivery people. My Aunt loved the flowers, said they were very fragrant and full. Just beautiful! Very easy to order, fast service and good communication. Beautiful vase, fresh flowers, although I was told there was no white rose, which I paid extra for. The recipient, however, still loved it. GiftTree was literally the only way I could get flowers to my best friend who just lost her own mother. I wanted to give her something beautiful for her first Mother's Day without her mom. No other website would deliver by Mother's Day - at least a 1-2 week wait (I waited a tad too long to order anything!). Gift Tree got the flowers there the day after Mother's Day as promised. Close enough for me! The flowers were absolutely gorgeous. My stepmother was very happy with this gift. My daughter Loved it for mother's day and her favorite color. The ordering was fairly simple and the flowers were beautiful according to my daughter. She really liked them. Recipient loved the flowers. I was pleased with the quality. Sent to Mother for her birthday. Very happy, effusive comments. Loved the Bouquet--her favorite color, even loved the ribbon and vase. You can't do much better than that! I bought 2 one for my mother in law and one for my wife.they were very happy with their Lavender Garden Bouquet and candy. Thank you. I coupled this with cookies and a box of candy. A perfect birthday gift! Not only were the flowers beautiful the customer service experience was amazing! Let me explain... I live out of state and my sister works in Utah. Her 50th birthday and she had to work. Perfect, I will send to her office as a surprise. I ordered early in the morning for same day delivery. At about noon I get a txt from my sister, she fell on the ice, broke her arm, and not going to work. I hurried to try to get a hold of customer service trying desperate to re-route the delivery. I got an answer to my phone call and email right away. They were so helpful and were able to deliver to her home, still the same day! I am so pleased with the service and the product. Highly recommend and I will be a repeat customer. Thank you! Great prompt service. No hassle. Thank you. Although the recipient was not in on the day I asked for delivery...they went right back the next day and delivered. I sent my Mother this "Good" bouqet for her Birthday. It was Beautiful! Very Full. It had great presentation! Thank you! I had to get last second flowers delivered to someone working in San Francisco... i was afraid they would take their time and the flowers wouldnt live up to the site billing... boy was i wrong! she loved it, they wrote exactly what i said on the greeting (hand-written) and it was just perfect. The flower arrangement looked beautiful, but unfortunately I was not there to see my mothers smile when she received them. Her favorite color is lavender and I knew she would be very pleased. Thank you very much for bringing so much happiness to my 92 year old mother. They arrived as promised. The flowers arrived fresh and beautifuly arranged. I will order from you again for my future needs. Thank you! The flowers I ordered for my friend's birthday were delivered on schedule and was very beautiful and fresh! She loved them! The flowers were absolutely beautiful! They arrived in perfect condition. Very fresh and actually better in person. I sent these to my best friend after a recent surgery. She absolutely loved them & said they are still fresh & perfect almost a week later!! All of her visitors have commented on how gorgeous the bouquet is & wanted to know where the flowers were from..............Very glad I chose this site to send flowers...Will definitely use again. I got this as a gift for a friend. The presentation was beautiful, everything I ordered was there (flowers and two teddy bears) and the card was written how I wanted. I clicked the ''deliver before 2pm" option and they were, indeed, delivered before 2pm. My aunt is like a mother to me since my mother passed two years ago. so I send my aunt Barbara flowers every year for mothers day and Xmas and her birthday. thank you very much for the great flower arrangement and delivery was right on time thanks again! Arrived a week ago in perfect condition and almost exactly as shown. One week later it is still perfect... I highly recommend. They were absolutely beautiful. I will keep ordering from here as I need to! Thanks very much!!! They were the perfect pick-me-up for my soon to be Mother-In-Law, while she was stuck in the hospital!!! My sister in law was very impressed! Thank you! They were fabulous. What a huge hit, not to mention beautiful. They were awesome thanks for the quick response on delivery for the next day. Thanks again! My husband's daughter had surgery and we sent the flowers to her at the hospital. However, she had already gone home, but somehow the delivery made its way to her house on the day it was supposed to be at the hospital. I don't know how they found her, but they did. Thanks. She loved the flowers! I did not see the flowers as I live in another state. My sister love the flowers and that is what I wanted. My wife still comments how beautiful this arrangement is. The mix is perfect and still fresh. Since Purple is her favorite color, these flowers made her extremely happy. Thanks for the good work provided by the Florist!! I was told that it was a lovely bouquet and delivered on schedule. Delivered flowers on time, wife loved the flowers. The flowers were gorgeous! They arrived on time and in great order! My friend was so pleased and sent me pictures of her flowers and they were more beautiful than the picure on your web site. She was thrilled and I thank you. The flowers arrived the same day I ordered. I sent the flowers to an out of state address. I sent this bouquet to my sister for her birthday and she called me since I live in another state and she was so surprised and happy with the flowers. I am so glad that my gift to her on her birthday gave her so much happiness. She raved about the bouquet and talked about the beautiful flowers and how they were arranged. I will definitely order again from you. The reciepent of these flowers absolutely loved them. They arrived on time and looked just like the picture on the website. Thank you and I will continue to use your service in the future. Keep up the good work. Will recommend your business to others. Flowers were great and well received! I sent these flowers to my Mom for her birthday (in Philadelphia USA), on which she happened to be in the hospital. These flowers cheered her no end and she said how beautiful the arrangement was. Also, all the Nurses and Doctors commented on how gorgeous this flower arrangement is. Not only that I heard from ALL my family that visited Mom in hospital about how beautiful and impressive this flower combination was and everyone wanted to know where it came from. Granddaughter received on graduation day and was absolutely thrilled. Purples are her favorite colors and she loved her flowers. I have never sent flowers that are more lovely than those from Gift Tree. My Mom's favorite color is purple, and she was so happy to receive this beautiful arrangement. I was happy to have them delivered on a Saturday with no problems. Thank you GiftTree for helping me make my Mom's birthday a special one!